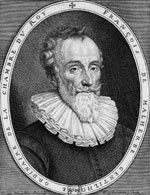 François de Malherbe (1555–1628), born in Caen in Normandy, belonged to the generation of French poets after Ronsard. He was the official court poet of both Henri IV and Louis XIII, remaining also in favour with Cardinal Richelieu. Malherbe was famous for this literary severity and set himself against the frivolity and freedom of the poets of the Pléiade.